Deadly Sleep begins with Nicola as a child, describing events that make her what she has become in present day. To be honest, I found the start of this book a bit hard to read at times. There were some moments that were very graphic, and gory, but they served to give you an idea as to why she is the way she is. When we meet Nicola in Bath, she is working in a nursing home, still following through with her desire to kill. She is living sparsely, surviving off wine and pizza. Still unseen. Parallel to this, we meet two members of the Police, DI Matt Foley and DS Tom Hudson who are hunting a suspected serial killer in Bath, who tortures and kills his victims. Oddly, a psychic connection develops between the killer and Nicola. When Nicola sleeps, she can see the killer torturing and killing his victims, but doesn’t know who she is seeing. Nicola can’t go on with the dreams, so she decides to go to the police. But will they believe her? I’ll be honest here, I found this bit to be a bit unbelievable. However, up until now, I wasn’t really enthusiastic about reading this. Once things started happening, my interest was piqued. The pace picked up pretty well, and there were a few incidents ( I don’t post spoilers!!!) that made me think ‘what the hell is going to be found?’. 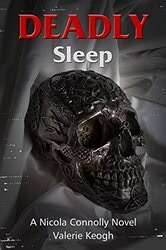 While Deadly Sleep wasn’t the usual rip-roaring, action filled crime thriller, especially considering the psychic element, it is by no means lacking once the investigation picks up pace. I quite enjoyed this book, and I gave it a solid 3 stars on Goodreads. The start of the book is where it fell down for me but once you get to see Nicola in Bath it really gets going! Thanks again to Valerie Keogh for the book!